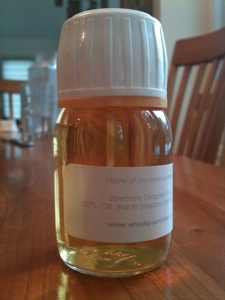 The Coopered Tot: Bowmore Tempest swirls rich sweet fruit and nut flavors with peat and tidal flats bitter tang. Funny what happens when a distillery bottles its whisky at a decent strength without chill filtration. Same thing with Glenfiddich's Distillery Edition. Thankfully it seems like we're slowly edging in that direction (Aberlour, Bunnahabhain, etc. ), but it's going to be a while (if ever) before 46%+ becomes industry standard. Yes Jordan, that seems to be the big lesson here - cask strength, no chill filtration, no coloring and barrel management that leads to stronger truer flavors (I think the use of first fill ex-bourbon casks is a big factor here with Tempest) is an emerging trend. As you say - this trend is becoming widespread: Glenlivet Nadurra, Glenfiddich DE, Aberlour Abunad'h, Red Breast CS, etc... It's brilliant. Yes, hopefully the distilleries will catch the drift and raise the standard expressions to 43-50% and skip chill filtering and coloring. We would all the winners for it. I agree with your assessment that it may be a long time coming. I suspect there's a bias towards "easy drinking" for the mass market and the distilleries would offer lower strength expressions to that segment if the law allowed. In the meantime we should vote with our dollars whenever we can by choosing higher strength expressions that are in their natural state. It's not a hardship. These drams rock and they take the addition of a drop of water with honeyed grace (generally). I think some of it may come down to the size of the distiller. When you're a big player like Glenfiddich/Balvenie or Diageo, you're putting out such a large volume that knocking down the ABV by a couple of percent represents a huge increase in potential profits. And sadly, Glenfiddich DE doesn't seem to be getting distribution in the States anymore. Seems like they don't want there to be any evidence that their standard whiskies could be better. I think that's part of why a lot of the distilleries that have been bumping up their ABV lately have been on the smaller side. There's less to be gained from diluting their whisky and they need to have something that let's them stand out from the competition. Although I agree with you both, there's always another side to every story. Glenfiddich is the number one selling malt in the world. Sales I'm sure are based on the fact that it's easy and gentle; I'm sure most sales go to whisky un-enthusiasts. Yes, releasing 46% and NCF would bring in a few whisky enthusiasts, but how much would you lose to Chivas and Glenlivet who would now be more gentle and accessible to newbies? 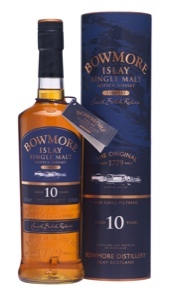 Similarly, although I am intrigued by Bowmore, how much of its sales are based on people who want a "gentle" Islay malt? 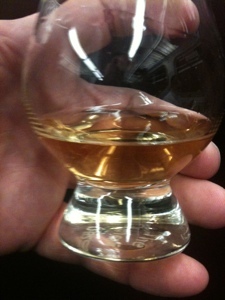 Maybe by releasing "craft" presentations, you'll nab a couple of Ardbeg/Laphroaig fans, but probably not that many. And you'll alienate your big customer base who wants the gentle Islay. In other words, even though we are not part of that market, there is a very large market for people who want 40% and gentle. Someone needs to fill it - they can't all be craft presentations. Why not do both? Well you still risk alienating your gentle customer base because they won't know the difference, so when they splurge on the more expensive craft presentation, it'll be too much for them and they won't enjoy it. The ones that recently are converting like Bunnahabhain and Tobermory are distilleries that struggle with single malt sales, so they have nothing to lose. Bowmore and Glenfiddich have a lot to lose. Yes, Ryan, I concur about the "easy and gentle" angle. That's what I was referring to in my first comment when I said "I suspect there's a bias towards "easy drinking" for the mass market and the distilleries would offer lower strength expressions to that segment if the law allowed." However Jordan is correct in pointing out that Bowmore's base expressions aren't very good and they aren't a big big player anyway. Bottom line, if lower proof, lower flavor density expressions sell well to a mass market - kudos for distilleries for producing fully flavored, higher proof, non-chill filtered uncolored expressions for those of us that care about those things. The more educated drinkers there are who care - the bigger the market for better whisky and the more better whisky the big distillers will be compelled to create. Ryan, I agree that it's a very tricky situation with trade-offs basically either way. Personally, I'd be happy enough if the distilleries just offered higher ABV versions of their whiskies without expecting me to pay an arm and a leg for it. Glenfiddich was actually doing a pretty good job of this by offering their Distillery Edition at basically the same price as the regular 15 year old and that was all well and good. It mostly lets them have it both ways, because the DE is "special" and didn't obviously crowd out its weaker sibling. I'm not sure if Bowmore and Glenfiddich are really comparable, since 'Fiddich has nearly 10x more capacity than Bowmore. Bowmore has roughly the same capacity as Bruichladdich, which isn't exactly a heavy hitter yet in terms of volume. Bowmore is also kind of an oddity, because its standard offerings, Legend and the 12 year, seem to be almost universally panned. It's one thing to be gentle, it's another to be close to undrinkable. Glenfiddich's basic whiskies might not get a lot of critical acclaim, but everyone will at least acknowledge that they're perfectly good for their target market. 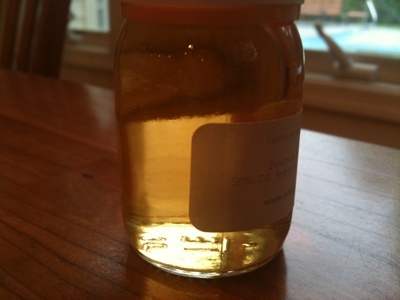 Admittedly, Morrison Bowmore might just not care, because blends are where the money is at. Achentoshen doesn't seem to get the attention it deserves either.